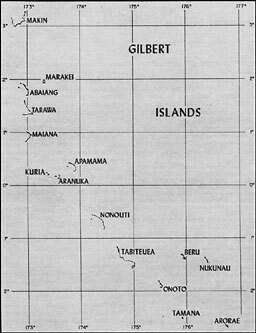 On 20 July the JCS ordered Admiral Nimitz to begin preparing for the capture, development, and defense of bases in the Gilbert group and on Nauru Island. This directive also provided for the occupation of any other islands that might be needed as air bases or naval facilities for the carrying out of the primary mission. GALVANIC was the code name assigned to the Gilberts-Nauru venture. The operation was intended to be a preliminary step to an attack against the Marshalls. At the same time, a lodgement in the Gilberts, in addition to bringing the Marshalls within range of land-based bombers, also would insure the safety of Samoa and shorten the line of communication to the South and Southwest Pacific. The bulk of the Pacific Fleet, the Central Pacific Force under Vice Admiral Raymond A. Spruance, was committed to the Gilberts operation. As commander of the GALVANIC expedition, Spruance was the immediate subordinate of Admiral Nimitz. The actual landings would be conducted by V Amphibious Force, headed by Rear Admiral Richmond K. Turner. This organization, established on 24 August 1943, was similar to the amphibious force that had carried out the Attu invasion. Within Turner's force was V Amphibious Corps (VAC), organized on 4 September and commanded by Marine Major General Holland M. Smith. The general had with him the same staff, with representatives from all services, that had aided in preparing for the Aleutians offensive. Like the original Amphibious Corps, Pacific Fleet, the new VAC was to train and control the troops required for future operations in the Pacific Ocean Areas. Nimitz had entrusted GALVANIC to a group of experienced Navy and Marine Corps officers. Spruance had commanded a carrier task force at the Battle of Midway; Turner had led the amphibious force that landed the Marines at Guadalcanal and Tulagi and had directed a similar force in operations against New Georgia; and Holland Smith had helped train troops for amphibious operations in Europe, North Africa, and the Aleutians. Preparations for the Gilberts invasion had been placed in capable hands. Because of the scope of the proposed Central Pacific campaign and the need in other theaters for Marine amphibious divisions, Army troops appeared certain to be needed for GALVANIC and later operations. Preliminary training, administration, and logistical support of these Army divisions fell to the Commanding General, Army Forces, Pacific Ocean Areas, Lieutenant General Robert C. Richardson. In carrying on his work, General Richardson was subject to the direction of Admiral Nimitz. When the JCS first began exploring the possibility of a thrust into the Gilberts, Admiral King had urged that only Marines be used in the operation. General MacArthur's needs for amphibious troops and the shortage of transports to bring a second Marine division to the Central Pacific prevented the carrying out of King's recommendation. General Marshall, on 29 July offered an Army unit instead, the 27th Infantry Division then in Hawaii, close to the scene of future combat. Although the unit had received no amphibious training, this was a deficiency that Holland Smith's VAC could solve. Although such a change in doctrine evolved eventually, in the relatively brief operations against the small atolls of the Central Pacific, the role of the naval comander in tactical operations remained paramount. There was little quarrel with the selection of Tarawa as an objective of the GALVANIC forces. 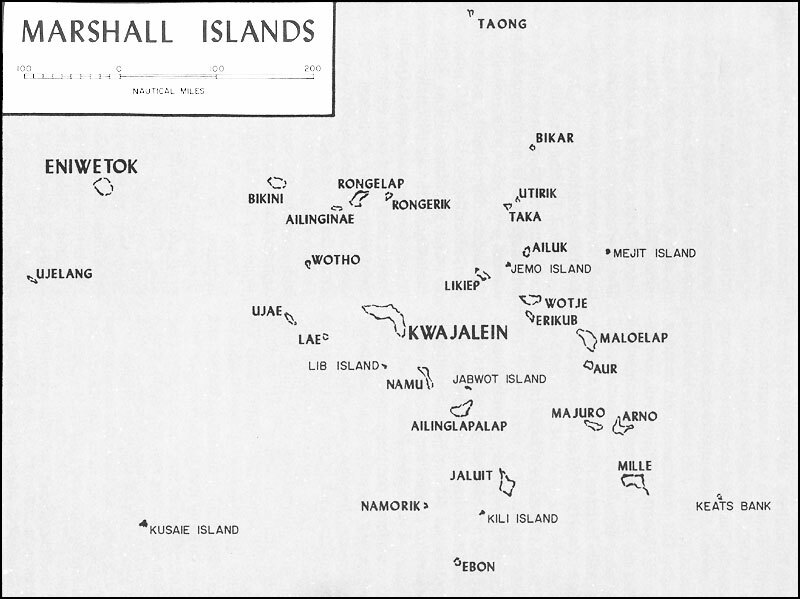 Although this atoll was heavily defended, its capture would cut in half the distance that American bombers would have to fly in raiding the Marshalls. Also, Betio Island in this atoll was the nerve center for the Japanese defense of the Gilberts. The responsible planners believed that the Gilberts could not be neutralized with the American strength then available until Tarawa was overrun. The capture of Apamama was also thought necessary if the Americans were to consolidate their hold on the Gilberts. Again, the primary consideration was to gain an air base from which to strike the Marshalls. This atoll promised to be the least difficult of the three objectives that Central Pacific planners wished to include in GALVANIC. Although the Gilberts group was not included by popular journalists among "Japan's Islands of Mystery," American planners knew very little about the one-time British possession. Charts and tide tables provided by the Navy Hydrographic Office proved unreliable. In fact, the maps prepared by the Wilkes expedition of 1841 were found to be as accurate as some of the more modern efforts. If the assault troops were to get ashore successfully, detailed intelligence had to be obtained on beach conditions, tides, and the depth of water over the reefs that fringed the atolls. Principal sources of such information were photographs taken from aircraft and submarines as well as interviews with former residents of the islands. Liberators (B-24s) and carrier aircraft, soared over Tarawa on 18-19 September and again on 20 October. Makin was photographed on 23 July and 13 October. Of the two atolls, Tarawa received better coverage, for only vertical aerial photos of Makin reached the joint intelligence center. Without oblique prints, photo interpreters had difficulty in estimating beach conditions and determining the exact nature of shore installations. In spite of this handicap, and the inability of interpreters to gauge the depth of water from aerial photographs alone, other information was evaluated in conjunction with the photographs and the work done by intelligence officers proved to be extremely accurate. The remarkable ability of the aerial camera to locate enemy positions and the skill with which these photographs were analyzed enabled the interpreters to estimate the size of the enemy garrison from a picture that showed the shoreline latrines on Betio. the information contained in them disseminated in time for the invasion. Intelligence officers also were able to gather together 16 persons familiar with the Gilberts. Travelers, traders, or former residents of the British colony, they were attached to Admiral Turner's staff. Those most familiar with Tarawa were sent to Wellington where the 2d Marine Division was training, while those who knew Makin best were assigned to the 27th Infantry Division in Hawaii. Additional intelligence on Makin came from Lieutenant Colonel James Roosevelt, who had fought there as executive officer of the 2d Marine Raider Battalion during the raid of 17--18 August 1942.
upon an accurate estimate on the depth of the water off Betio. The first estimate made by amphibious force intelligence officers predicted that during the period of lowest tides no more than two feet of water would cover the reefs off the northern coast of Betio. Turner's staff also was aware that during the lowest period, tides at the island might ebb and flow several times in a single day. There was the remote possibility of a freak "dodging tide," a tide with an eccentric course that could not be foreseen or predicted. Such tides had been reported, but few of the islanders had experienced one. On the other hand, those officers responsible for GALVANIC could take heart from the fact that some of the island traders who had sailed among the Gilberts predicted that there would be five feet of water, more than enough for the landing craft. Some of the Americans chose to be optimistic. Among those who entertained doubts concerning the depth of water over reef at Betio was Major F. L. G. Holland, a New Zealander and former resident of Tarawa Atoll. Assigned to the staff of General Julian Smith, Holland did not accept the estimate of five feet, but he could not disprove the tide tables prepared by his fellow experts. He could, however, point out that during the neap period tides ebbed and flowed irregularly and warn the Marines to expect as little as three feet of water at high tide. After listening to the New Zealand major, Julian Smith decided to prepare for the worst. The troops embarked in LCVPs were briefed to be ready to face the possible ordeal of wading ashore in the face of Japanese fire. The best that Julian Smith could foresee was a 50-50 chance that landing craft would clear the reef. 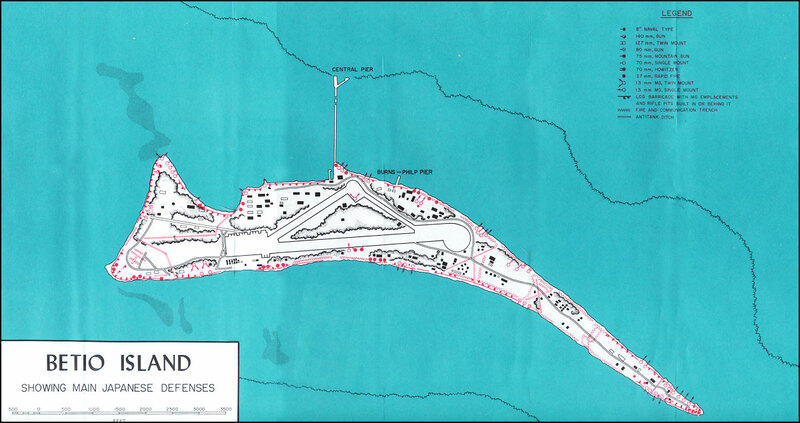 Hydrographic and reef conditions also helped dictate the choice of landing beaches. On the south or ocean side of Betio, the reef lay about 600 yards from the island proper, but heavy swells rolled in from the open sea, a factor which might complicate the landings. To land directly from the west would mean crossing both the barrier and fringing reefs as well as battling strong and unpredictable currents. Aerial photographs showed that the enemy defenses were strongest on the seaward side and that the beaches were heavily mined.17 The choice, then, narrowed to the lagoon side where the reef, though wide, rose gradually to the surface. In addition, the island itself would serve as a breakwater to ships maneuvering within the lagoon. Photographs of Butaritari, best clue to Japanese strength, led planners to believe that only 500 to 800 troops were available for the defense of the island. This total included an infantry company, a battery of four heavy antiaircraft guns, and two antiaircraft machine gun batteries. Most of the enemy installations were located in the vicinity of Butaritari Village within an area bounded on east and west by antitank ditches. Unlike the reef off Betio, the coral outcropping around Butaritari was not considered a particularly difficult obstacle. Along the lagoon shore and off the southern part of the west coast at the island, the reef was considered to be so close to the beaches or so flat that it could be crossed quickly. Even if the LCVPs grounded at the edge of the reef, intelligence officers felt that the soldiers could wade ashore without difficulty. The basic organization for GALVANIC was established by Operation Plan 143, issued by Admiral Spruance on 25 October. The task organization consisted of three major groups: Rear Admiral Charles A. Pownall's Carrier Task Force (TF 50), Admiral Turner's Assault Force (TF 54), and Defense Forces and Land-based Air (TF 57) commanded by Rear Admiral John H. Hoover. The Assault Force was divided into two attack forces. One of these, the Northern Attack Force (TF 52) remained under Turner's command and was assigned to capture Makin. The other, Southern Attack Force (TF 53) under Admiral Hill, was to seize Tarawa and Apamama. the operation, and guarding against submarine attack. The land-based planes of TF 57 were to help gain mastery of the skies over the Gilberts. Flying from airstrips on Baker Island and in the Ellice, Phoenix, and Samoan groups, Admiral Hoover's aircraft, including the planes of the Seventh Air Force, were to blast those bases from which the enemy might interfere with GALVANIC. In addition, this force was to bomb the assault objectives and conduct long-range searches. The overall plan for GALVANIC called for the 2d Marine Division (less one regiment in corps reserve) to storm Tarawa, while the 165th Infantry of the 27th Division took Makin. 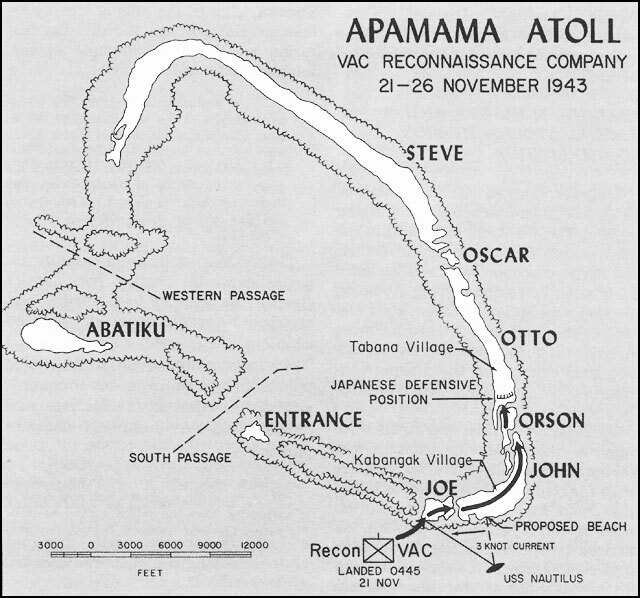 Elements of the Marine reserve regiment could be employed at either objective, depending upon the enemy's reaction, or used to occupy Apamama. When and where the reserve would be committed was a decision that Admiral Turner alone would make. The force commander, however, might rely upon the advice of Holland Smith. At both Makin and Tarawa, it was planned that the first few waves would churn ashore in amphibian tractors, vehicles that had been ferried to the objective in tank landing ships (LSTs). Off the atolls, the landing ships would stop, open the huge doors in their bows and disgorge the tractors down a lowered ramp into the water. Since the assault troops would be in transports, it was necessary that they first climb down heavy nets to enter LCVPs from which they later would transfer to LVTs. The tractors would then maneuver to form waves, each one destined for a particular beach. Plans called for minesweepers to sweep the lagoon entrance, anchor buoys to mark the cleared channel, and take position at the line of departure. At this line, the waves were to be guided into lanes leading directly to the assigned beach and at a given signal sent racing across the line toward the island. Ships, Dock (LSDs) , the USS Ashland and Belle Grove, had been assigned to carry the medium tanks for Operation GALVANIC. These ships would perform basically the same service for the Landing Craft, Medium (LCMs) and the tanks they carried that the smaller LSTs did for the amphibian tractors. The holds of the LSDs would be flooded to enable the landing craft to float through an opening in the stern. Once afloat, the LCMs would head for the rendezvous area for assignment to the proper boat wave, the first leg in their journey into battle. D-Day at both objectives was to be ushered in with an aerial attack. From 0545 to 0615 carrier planes would bomb and strafe enemy troops and installations. After the aviators had completed their final runs, the fire support ships would begin a 21/2-hour hammering of the objectives. Scheduled to blast Butaritari Island at Makin were four old battleships, four cruisers, and six destroyers. Betio Island, Tarawa Atoll, was destined to shudder under the weight of high explosives thrown into it by three battleships, five cruisers, and nine destroyers. Never before had such powerful seaborne batteries been massed against such small targets. The result, naval gunfire planners optimistically hoped, would be devastating, although few experienced officers looked for total destruction of the enemy defenses.25 When the naval guns had ceased their thundering, the carrier planes would return for a five-minute attack on the invasion beaches as the assault waves were moving ashore. Naval gunfire, to be delivered on D-Day and after, was scheduled for both objectives. When the ships opened fire depended upon the enemy's reaction, for any Japanese batteries that threatened the unloading would have to be silenced. Preparatory fires on D-Day, divided into two phases, were to begin after the first air strike. First, the support ships would deliver 75 minutes of pre-arranged neutralization and counterbattery fire, if necessary closing the range to as little as 2,000 yards in order to knock out protected coastal defense guns. The second phase, to last for 45 minutes, called for an increasingly heavy bombardment of assigned areas with the combined purposes of destroying emplacements along the invasion beaches and neutralizing enemy defenses throughout the islands. At Tarawa, the support ships were positioned to fire from the west across Betio, since fire from the south might cause ricochetting shells that could fall into troop assembly areas on the lagoon side of the island.26 Once the assault troops were ashore, certain warships could be called upon to blast specific targets that impeded the American advance. During the preparatory shelling, however, all ships were to fire for the most part into areas rather than at selected strongpoints. The plan prepared by the 2d Marine Division had its origin early in August, when Admiral Spruance visited General Julian Smith's headquarters at Wellington, New Zealand. At this time the admiral verbally assigned the capture of Tarawa Atoll to the division. During the conference, the problem of the reef at Betio was discussed, and division planners made a tentative decision to land the first three waves in amphibian tractors. The final judgment would depend upon the results of tests of the ability of LVTs to clamber over coral ledges. 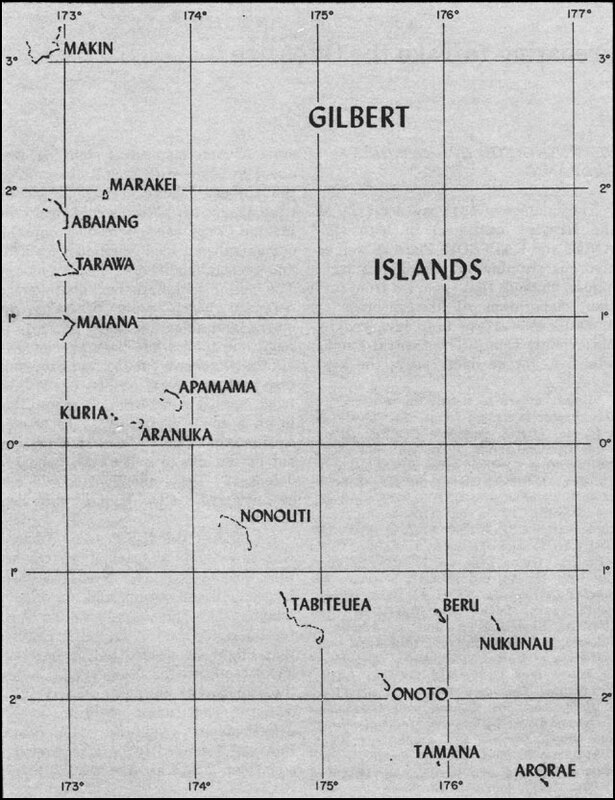 Following these talks, the division received its first written directives, documents based on the original Gilberts-Nauru concept. Since the Marines' objectives were Tarawa and Apamama, the later substitution of Makin for Nauru did not disrupt staff planning. might serve as the site for artillery. One alternative remained--a direct frontal attack without the prelanding support of division artillery. Aware that an assault of the type confronting him was the most costly of operations, Julian Smith asked for definite orders. 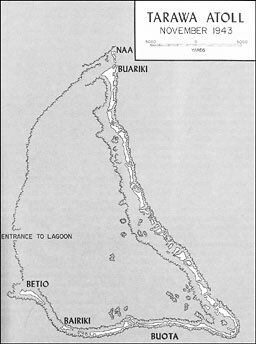 "I discussed the matter fully with the Corps commander," he later recalled, "and when informed that the decision to make the attack directly on Betio was final and must be accomplished by the Second Marine Division less the combat team assigned to Corps reserve, I requested that my orders be so worded as I did not feel that the plan should be my responsibility. "28 Orders were promptly issued by VAC to seize Betio before occupying any of the remaining islands in the atoll. The 2d Marine Division operations order, completed on 25 October, called for Combat Team 2 (2d Marines, reinforced, with 2/8 attached) to make the assault landings. 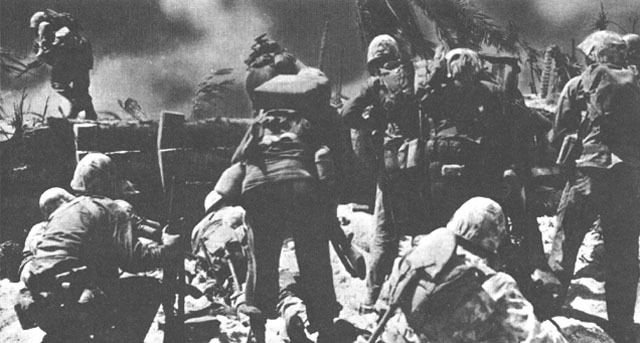 The remaining two battalions of the 8th Marines, along with the regimental headquarters, were held in division reserve, while the 6th Marines remained under corps control. Elements of the 10th Marines, division artillery, a part of Combat Team 2, would be landed as quickly as possible to support operations ashore. From the 18th Marines, Julian Smith's engineers, came another part of the combat team, demolitions and flamethrower men to assist the infantry battalions, as well as the shore party that had the task of speeding supplies to the front lines. The nearest source of additional tractors was San Diego. Although there was neither time nor shipping to get large numbers of these vehicles to New Zealand, 50 LVT(2)s were shipped to Samoa. Members of the 2d Amphibian Tractor Battalion went to that island to form a new company which would join the division off Tarawa. The new LVT(2) was an improved version of the tractor already in use by the division. Horsepower had been boosted from 146 to 200, a change which enabled the LVT(2) to move slightly faster while carrying 4 more men or 1,500 more pounds of cargo than its predecessor. Also, the new model could cruise for 75 miles in the water, compared to 50 miles for the LVT(1). Tests were ordered in which the new tractors ran 4,000 yards with a full battle load to determine the time it would take the LVT(2), which proved capable of making at least four miles an hour.31 Each LVT(2) was equipped with portable armor plate for the front, sides, and cab. These plates could be used during assault landings or removed if there was no danger of enemy fire. tanks of the division and finally the initial waves of landing craft. Planning for the employment of the 27th Infantry Division was handicapped by the substitution of Makin Atoll for Nauru Island. In addition, there was a difference of opinion between General Ralph Smith, the division commander, and General Holland Smith of VAC. 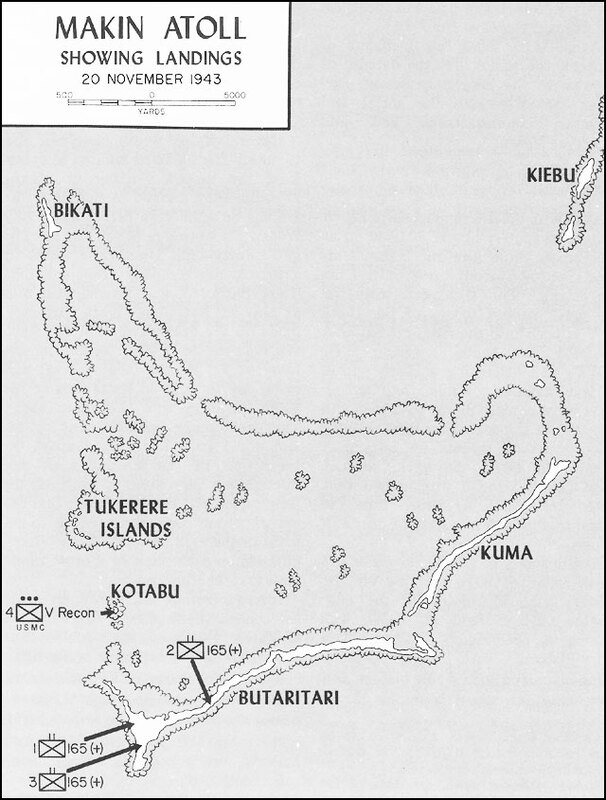 The corps commander preferred to assault Butaritari from the lagoon side, bringing the maximum strength to bear against a small portion of the coast. On the other hand, the Army general wanted to land two battalions on the west coast of the island and two hours later send a single battalion ashore near the waist of objective. This second blow would be delivered from the lagoon. Ralph Smith's views prevailed, and the Marine general gave rather reluctant approval to the scheme. Assigned to the Makin operation was the 165th Regimental Combat Team (RCT). With a total of 6,470 men, this heavily reinforced unit outnumbered the estimated defenders of Butaritari by roughly 8-to-1. Three reinforced companies from the 105th Infantry, 582 officers and men in all, had been assigned to the landing force. One of these companies would, if LVTs became available, spearhead each of the assault battalions. This mixing of units was brought about by the shortage of amphibian tractors. Since it seemed for a time that none of these vehicles would be available, Ralph Smith scheduled all assault elements of the 165th Infantry to train with and land from LCVPs, while reserving the tractors for the men of the 105th. Thus, there would be no need to adjust his plans if the promised tractors did not arrive, for the men from the 105th could remain in reserve. On the other hand, if the LVTs did appear, they could be used by the detachments from the 105th Infantry, and again no violence would be done to the basic landing plan. In Ralph Smith's opinion, the rapid capture of the tank barrier guarding the western limits of the main defenses was of the greatest importance. It was to gain this end that he had proposed two separate landings followed by a pincers movement against the enemy stronghold. Such a maneuver, however, would depend on close coordination between the attacking units and reliable communications with the artillery batteries that had landed over the western beaches. Another solution to the problem posed by the tank barrier would have been to rake the obstacle with naval gunfire. At the time, however, neither Ralph Smith nor his staff were impressed with the effectiveness of seaborne artillery. Instead of seeking aid from sharpshooting destroyers, they preferred a combination of land weapons--infantry, artillery, and armor. plan for GALVANIC was considered adequate, even though it could have been improved. Principal objections to the communications annex issued by Spruance's headquarters were twofold: it was too long, 214 mimeographed pages, and it should have been distributed sooner. The second criticism was justified, but the staff had worked against an impossible deadline; those who objected to the bulk of the document would later admit that an overall plan, huge though it might be, was preferable to several briefer, less detailed, and possibly conflicting plans. Secrecy was the watchword during the preparation for GALVANIC, and this mood of caution was to prevail during the approach of the expeditionary force. Since strict radio silence was necessary, only VHF (Very High Frequency) and TBS (Talk Between Ships) equipment could be used within the convoys. Visual signals were substituted whenever possible for routine radio messages, but signalmen proved rusty at first. Although speed came with practice, the vast number of visual signals, which reached as many as 80 per day off Tarawa, led to the establishment, en route to the target, of areas of operational responsibility within the task force. Had this practice not been adopted, hours would have been lost in passing messages from ship to ship to insure that every element of the force had got the information. As it was, certain vessels were to pass on information to ships within specified sectors. Keeping contact between ships and shore was certain to be the most difficult aspect of the GALVANIC communications problem. Neither LSTs, transports, nor the beachmasters were equipped with the SCR--61O radio, and this set turned out to be the best piece of signal equipment ashore on Betio.34 During the first crucial days, these sets would often provide the only means of radio contact between the beach and the task force. The Marines themselves were saddled with the TBX and TBY, two low power sets whose general worthlessness brought the postoperation comment that: "light weight but powerful and rugged portable equipment having full frequency range and capable of sustained operation does not appear available in any standard type. "35 The TBX lacked the necessary range, and the TBY was not sufficiently waterproof. Both the Marines and soldiers had wire equipment with which to establish communications within the beachhead area. Unfortunately, the generator armature of the standard EE--8 field telephone and the drop coil of its companion switchboard were not waterproof and therefore unreliable in amphibious operations. Also, to avoid damage by troops and tracked vehicles as well as short circuits caused by dampness, it was desirable to string telephone wires above the ground, something that could not easily be done in the face of enemy fire. GALVANIC could not succeed unless a steady current of supplies was kept moving from the holds of the transports to the front lines. First step in this process was the rapid unloading of cargo, and to gain speed both the Army and Marine divisions combat loaded their shipping. Cargo was so stowed that items needed early in the fighting were at the top of the holds and close to the hatches. Because vessels were dispatched to the 2d Marine Division piecemeal, as quickly as they were released from other duties, the division staff could not predict how much cargo space would be available. Sometimes the blueprints provided by the arriving ships were outdated and no help to the hard-pressed planners. The Marines, nevertheless, managed to do a creditable job; in fact, the only snag in unloading came as a result of the re-arranging of cargo in ships at anchor off Tarawa. The vessels carrying the 27th Infantry Division troops also were effectively combat loaded. Lieutenant Colonel Charles B. Ferris, division G-4, organized a transport quartermaster school and sent his students to Pearl Harbor to learn the characteristics of naval transports as well as loading techniques. In addition, the supply section of the Army division resurrected the stowage plans drawn up for the Attu operation, studied them, and used them as guides for plans of their own. In handling cargo, the Army division had a decided advantage over its Marine counterpart. While the 27th Infantry Division had some 1,800 sled and toboggan type pallets, the 2d Marine Division had almost none, a deficiency caused when the necessary materials to build them failed to reach Wellington in time. Pallets meant easier handling of cargo because several heavy boxes could be lashed to a wooden platform, stowed and unloaded as a single unit, and hauled intact to the using unit. available, Marines and sailors would begin unloading cargo from the transports. Supplies were to be loaded into the boats according to a fixed priority, but dispatchers would not send the boats shoreward unless told to do so by the commander of the regiment for whom the cargo was destined. En route to the beach, all supply craft had to report to control officers who made sure that the incoming boats were headed toward the proper sector and that a shore party was on hand to unload them. LVTs, LCVPs, and LCMs all might haul supplies, but the last, with its 30-ton capacity, was considered most valuable. An orderly logistical effort also required that beach party and shore party units land with the assault battalions. In charge of each beach party was a naval officer, the beachmaster, who assisted the shore party commander, and also supervised marking the beaches, evacuating the wounded, and the other tasks performed by his men. A Marine officer commanded the shore party, which was primarily concerned with unloading the incoming boats, sorting supplies, and storing them or moving them inland. At Betio some of these activities could be concentrated at the long pier near the waist of the island. This structure was accessible to landing craft, for its jutted beyond the reef, and a boat channel had been dredged along its western side. Since protracted fighting was expected at neither Makin nor Tarawa, both divisions limited the amount of supplies to be carried to the target area. The transports assigned the 165th RCT carried the assault troops, their equipment and weapons, 5 units of fire per weapon, plus 10 days' rations, 2 days' K rations, and such miscellaneous items as medical supplies, ordnance spare parts and cleaning equipment, and fuel enough to last the vehicles on board for 7 days. Stowed in the assault cargo ship assigned to the Makin landing force were 24 days' B rations for the entire command, 15,000 gallons of water, 8 days' motor fuel, and additional ammunition. Three LSTs carried still other supplies. The 2d Marine Division also attempted to keep a tight rein on its supplies. To be embarked with the convoy carrying the assault and garrison forces were 30 days' B rations, 5 days' C or K rations (later changed to 3 days' K and 10 days' C), 2 days' D rations, and enough water to provide 2 gallons per day to each member of the command for a period of 5 days.38 Within five days, water distillation equipment would be operating. Enough maintenance supplies, fuels, and lubricants to last 30 days were loaded in the transports. Also on hand were construction, medical, and aviation supplies for 30 days. Although antiaircraft weapons were allotted 10 units of fire, coast defense guns and all other weapons received 5. Upon assuming command of the 2d Marine Division on 1 May 1943, Julian Smith inherited a veteran unit but one that still was suffering the effects of the Guadalcanal fighting. The division had arrived in New Zealand with 12,500 diagnosed cases of malaria, many of whom eventually were evacuated to the United States. So serious was the health problem that as late as 10 October malaria victims were being admitted to the hospital at the rate of 40 per day. Even as the new commanding general was taking charge, the first replacements began arriving. More would follow until the organization reached combat strength. Fitting these men into the division team was one of the problems facing the new commander and his staff. The 27th Infantry Division, untried in combat, was also new to the techniques of amphibious warfare. Preparing this division for Operation GALVANIC was a task shared between General Richardson's headquarters and Holland Smith's VAC. The Army command handled training for ground combat as well as certain phases of pre-amphibious training, while the Marine headquarters concentrated on the ship-to-shore movement. Logistical planning and routine administration for Army troops also lay within the province of General Richardson. Admiral Turner's ships and General Holland Smith's instructors. Training of the 27th Infantry Division came to a climax with a series of amphibious exercises held in the Hawaiian Islands. Bad weather and poor beaches hampered the earlier efforts, and the rehearsals were of questionable value. During the first two rehearsals, the troops landed, but no supplies were put ashore. Because of rock-strewn beaches, assault craft did not advance beyond the line of departure in the third or dress rehearsal. Preserving scarce LVTs from possible damage was judged more important than any lessons the troops might learn. Preparations for the Gilberts invasion included certain preliminary combat operations, some remotely connected with GALVANIC, and others designed specifically to batter the assault objectives. American might first made itself felt in the Gilberts in February 1942 when carrier planes lashed at Makin Atoll. In August of the same year, Marine Raiders startled the Japanese by making a sudden descent on Butaritari Island. In April of the following year, after a series of reconnaissance flights, heavy bombers of the Seventh Air Force, operating from Funafuti and Canton Island, began harassing Nauru and targets in the Gilberts. Islands and the 2d Marine Airdrome Battalion established itself at Nukufetau in the same island group. Both landings were made during August 1943. A third air base was established in September at Baker Island, an American possession which had gone unoccupied since the coming of war. The last of these fields to be completed, that at Nukufetau, was ready on 9 October. The Navy was far from reluctant to risk its carrier planes against Japan's island fortresses. In fact, Admiral Pownall's fast carriers went into action even before the Seventh Air Force had launched its intensive aerial campaign. On 17 and 18 September, planes from three aircraft carriers blasted Makin, Apamama, Tarawa, and Nauru. The naval aviators were assisted by B--24s from Guadalcanal, Canton Island, and Funafuti, aircraft which carried cameras as well as bombs, and other Liberator bombers struck the Gilberts on the following day as the carriers were withdrawing. 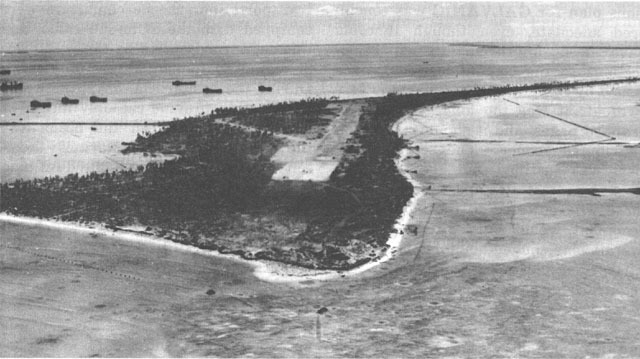 Next the carriers attacked Wake Island on 5 and 6 November. Although Japanese strategists dismissed the Makin raid as an attempt to pin down troops in the Central Pacific while new operations were launched to the southwest, the vulnerability of the Gilberts certainly shocked them. Unless these outlying islands were garrisoned in some strength, they would fall to the Americans and serve as bases for a thrust into the far more valuable Marshalls. Reinforcements were started toward the Gilberts, fortifications were thrown up throughout the group, and British citizens overlooked since the occupation were hunted down. In May 1943, Japanese naval leaders conferred at Truk, and out of these discussions evolved a plan to counter any American thrust into the Gilberts. Should Nimitz choose to attack, Japanese bombers from the Bismarcks would swoop down on his convoys, land at fields in the Gilberts and Marshalls, refuel, rearm, and return to action. Meanwhile, short-range planes were to be shuttled into the threatened area by way of Truk and other bases. Fleet units would steam eastward from Truk to cooperate with Bismarcks-based submarines in destroying the already battered invasion force. Betio Island, in keeping with defensive theory advanced as part of Z Operation, was heavily fortified. The basic defensive pattern selected for the island called for a series of strongpoints with the spaces between them covered by fire. American assault forces were to be cut down at the beach. Should the invaders manage to gain a foothold on the island, determined counterattacks would be launched to hurl them back into the sea. In command at Tarawa was Rear Admiral Keiji Shibasaki of the 3d Special Base Force. He had at his disposal 1,122 members of this force and 1,497 men of the Sasebo 7th Special Naval Landing Force (SNLF). In addition to these combat troops, the admiral had a large contingent of laborers, 1,247 from the 111th Construction Unit and 970 from the 4th Fleet Construction Department Detachment. Since many of the laborers were Koreans and most were untrained, Shibasaki could rely on no more than about 3,000 effectives. Admiral Shibasaki planned to destroy the enemy forces as they landed, but he did not overlook the possibility that the attackers might gain a lodgment on the island. A log fence just inland of the beaches, antitank ditches, and other obstacles were arranged to confine the assault force to a tiny strip of coral sand, where it could be wiped out. bombs. These positions, however, were not designed primarily for defensive fighting. Although some fitted into patterns of mutual defense, most of them had blind spots, not covered by fire, from which flamethrower or demolition teams could close for the kill. Far less formidable were the defenses of Butaritari Island. There Lieutenant Junior Grade Seizo Ishikawa commanded no more than 384 combat troops, 100 of them marooned aviation personnel and the remainder members of his 3rd Special Base Force Makin Detachment. Also present, but of doubtful effectiveness, were 138 men of the 111th Construction Unit and 276 from the 4th Fleet Construction Department Detachment. Instead of steaming to Hawkes Bay, the transports joined Admiral Hill's Southern Attack Force at Efate in the New Hebrides, where rehearsals were held. During the first of these, troops landed at Mele Bay while the support ships simulated a bombardment of Pango Point. The second rehearsal saw the division land again at Mele Bay and the warships actually pump shells into Erradaka Island. At this time, the commander of the assault regiment, Colonel William McN. Marshall, fell ill. To replace the stricken leader, Julian Smith selected his operations officer, Lieutenant Colonel David M. Shoup, who was spot promoted to colonel.
. . . ," read his message to the division, "you will decisively defeat and destroy the treacherous enemies of our country; your success will add new laurels to the glorious tradition of our Corps. "54 An intensive briefing for all hands followed this announcement, and the mighty task force bored onward toward its goal. The first contact with the enemy came on 18 November, when a carrier plane sighted a Japanese aircraft far in the distance. On the following morning, a four-engine patrol bomber was picked up on radar, intercepted, and destroyed. No waves of bombers challenged Hill's ships as they began their final approach to Tarawa. At 2033, 19 November, USS Ringgold, the destroyer leading the task force, picked up Maina Atoll, and Hill's ships altered course to close with their objective. Around midnight the fire support sections began steaming to their assigned stations. Transports crammed with Marines eased into unloading areas. Finally, at 0507 on 20 November, shore batteries on Betio opened fire, and the battle was underway. General Holland Smith did not accompany the Tarawa expedition, for he had been ordered to embark in Admiral Turner's flagship, and the latter officer had taken personal command of the Makin task force. The admiral reasoned that since Makin was nearer to the Marshalls, Japanese surface units, if they chose to intervene, would probably strike the Northern Attack Force. Events during the approach of the Northern Attack Force seemed to bear out Turner's theory. On 18 November a Japanese bomber attacked a group of LSTs but was beaten off by antiaircraft fire. Another bomber appeared the following afternoon and fell victim to Navy fighters. A night attack, delivered against the LSTs on 19 November, ended with the destruction of one enemy bomber and the escape of a second.55 The Japanese, however, did not contest the final maneuvering of the task force, and at first light on 20 November the preliminary bombardment began. The Japanese were never able to carry out the ambitious program of counterattacks against a Gilberts invasion force envisioned in their Z Operation plan. The carrier aircraft that were to have sortied from Truk and the Bismarcks had been severely depleted in a series of air battles over Rabaul in early November, as Admiral Halsey's and General MacArthur's fliers struck the enemy base in covering strikes for the landing at Bougainville.56 Although it was not known at the time, Admiral Turner's Assault Force was insured against an enemy attack in any significant strength. Unless otherwise noted, the material in this chapter is derived from: CinCPac OPlan 1--43, dtd 5Oct43, hereafter CinCPac OPlan 1--43; ComCenPacFor OPlan 1-43, dtd 25Oct 43, hereafter ComCenPacFor OPlan 1--43; V PhibFor AR Gilbert Islands, dtd 4Dec43, hereafter V PhibFor AR; CTF 54 OPlan A2--43, dtd 23Oct43; CTF 53 OPO A101-43, dtd 17Oct 43, hereafter CTF 53 OpO A101-43; VAC AR GALVANIC, dtd 11Jan44, hereafter VAC AR; VAC OPlan 1-43, dtd 13Oct43; 2d Mar Div OpO No. 14, dtd 25Oct43, hereafter 2d MarDiv OpO No. 14; TF 11 AR Baker Island, Sep43 (Baker Island Area OpFile, HistBr, HQMC) ; Samuel Eliot Morison, Aleutians, Gilberts, and Marshalls, June 1942-April 1944--History of United States Naval Operations in World War II, v. VII (Boston: Little, Brown and Company, 1960 ed. ), hereafter Morison, Aleutians, Gilberts, and Marshalls; Crowl and Love, Gilberts and Marshalls; Isely and Crowl, Marines and Amphibious War; Capt James R. Stockman, The Battle for Tarawa (Washington: HistSec, DivPubInfo, HQMC, 1947), hereafter Stockman, Tarawa. Unless otherwise noted, all documents cited in this part are located in the Gilberts Area Op File and the Gilberts CmtFile, HistBr, HQMC. It is interesting to note that the Gilberts did not appear as an objective in the ORANGE Plans. Moore Comments. Adm Harry W. Hill interview with HistBr, G-3, HQMC and cmts on draft MS, dtd 4Oct 62, hereafter Hill interview/comments. Richard W. Johnston, Follow Me! The Story of the 2d Marine Division in World War II (New York: Random House, 1948), p. 89, hereafter Johnston, Follow Me! Edmund G, Love, The 27th Infantry Division in World War II (Washington: Infantry Journal Press, 1949), pp. 11--22. Gen Thomas Holcomb interview by LtCol Robert D. Heinl, Jr., dtd 12Apr49, cited in Hough, Ludwig, and Shaw, Pearl Harbor to Guadalcanal, p. 342. Adm Raymond A. Spruance, "The Victory in the Pacific," Journal of the Royal United Service Institution, v. 91, no. 564 (Nov46) , p. 544; Moore comments. Adm Raymond A. Spruance ltr to ACofS, G--3, HQMC, dtd 24Jul62. Additional sources for this section include: VAC G--2 Study, TO Gilbert Islands, Nauru, Ocean, dtd 20Sep43, pp. 21--48, 61--67; 2d MarDiv Est of Sit--Gilberts, dtd 5Oct43; 2d MarDiv SupplEst of Sit, dtd 25Oct43; 2d MarDiv D--2 Study of Makin Island and Little Makin, n.d.; 2d MarDiv D--2 Study of Tarawa, n.d.; IntelEst, Anx D to 2d MarDiv OpO No. 14. During much of World War II, Marine division general staff officers were designated D-l, D-2, D-3, and D-4, and comparable corps staff officers as C-l, etc. Eventually, the Marine Corps adopted the Army system of designating all general staff officers at division and above as G-l, etc. Gen David M. Shoup interview with Hist Br, G-3, HQMC and cmts on draft MS, dtd 14Aug62, hereafter Shoup interview/comments. Tests of this camera, made with the cooperation of VAC and 27th Division G-2 officers, "resulted in the development of a holding frame, sequence timing for stereo overlap, etc." Col Cecil W. Shuler comments on draft MS, dtd 12Dec62. The determination of the caliber of these guns was made by relating their size in aerial photographs to the known dimensions of wrecked aircraft on the airfield at Betio. Shoup interview/comments. 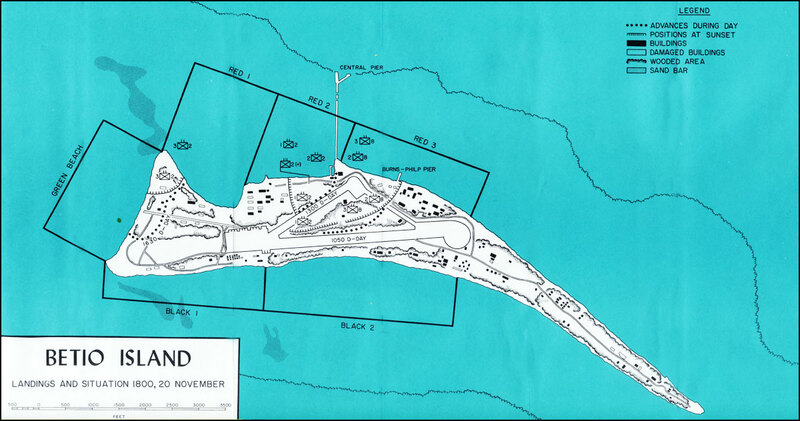 VAC and 2d Division planners could plainly see the seaward beaches were mined, but the lagoon side was a different matter. The enemy troops there "were in the business of working on their defenses--unloading steel rails, concrete, etc., besides their regular logistic support within the lagoon. . . . The question was what you would do if you were on the island," General Shoup recalled. "Chances are you would mine everything but the place you use daily--that would be the last place to be sewed up. This conclusion was a very definite factor in our decision to land where we did." Ibid. 2d MarDiv OPlan No. 1, dtd 30Oct43. ComdrCenPacFor ltr to CG, VAC, ser 0081, dtd 14Oct43 (S--1 File, Comd Relationships, HistBr, HQMC). CinCPOA ltr to CGAFPOA, ser 00249,dtd 25Oct43 (OAB, NHD). General Richardson's request for clarification of the tactical command structure was made to insure that it was in accord with Army doctrine and that the corps commander would be the superior officer from whom the 27th Division commander received his combat orders. CGAFPOA ltr to CinCPOA, dtd 17Oct43 (OAB, NHD). The commanding officer of the transport group which landed the Marines at Tarawa, recalled stating his doubts of the efficacy of this fire "very forcibly during a conference at Wellington, N.Z. I had witnessed a similar bombing and bombardment of Gavutu Island, in the Solomons, where I landed a Marine Paratroop outfit. From daylight to noon this little island was subjected to repeated bombing attacks and bombardment by cruisers and destroyers. The results had been most disappointing." RAdm Herbert B. Knowles ltr to ACofS, G-3, HQMC, dtd 1Sep62, hereafter Knowles ltr. LtGen Julian C. Smith, "Tarawa," U. S. Naval Institute Proceedings, v. 79, no. 11 (Nov 53), p. 1170, hereafter Smith, "Tarawa"; VAC NGF Spt Plan, dtd 13Oct43, Anx B to VAC OPlan 1--43, dtd 5Oct43; TF 53 NGF Spt n.d., Encl A to TF 53 Rpt of Tarawa Ops, dtd 13Dec43, hereafter TF 53 AR. Smith, "Tarawa," p. 1167; LtGen Julian C. Smith ltr to ACofS, G--3, HQMC, hereafter Julian Smith ltr. Ibid., p. 1166. For details concerning various models of the LVT, see ONI, ND, Supplement No. 1 to ONI 226, Allied Landing Craft and Ships (Washington, 1945). Ibid. General Shoup was later told that three B--24s with these bombs on board actually took off, but that one crashed on takeoff, one flew into the water, and the third did not reach its destination. Shoup interview/comments. A search of Seventh Air Force records in the USAF Historical Archives failed to reveal any mention of this request. Dr. Robert F. Futrell, USAF Historian, ltr to Head, Hist Br, G-3, HQMC, dtd 20Aug62. Additional sources for this section include: CinCPac Comm Plan, n.d., Anx A to CinCPac OPlan 1-43, dtd 5Oct43; Rpt of GALVANIC Comm, dtd 4Dec43, Encl D to V PhibFor AR; TransArea Debarkation and Unloading Plan, n.d., and Unloading and Beach Pty Plan, n.d., Apps 1 and 2 to Anx D to TF 53 OpO A101--43; SigRpt, dtd 4Dec43 with Suppl, dtd 3Jan 44, and TQM Report, dtd 30Dec43, Encl F to VAC AR. "The SCR--61O and the ship-carried SCR-608 were Army radios ëappropriated' by the Navy transports that served in the Aleutians and were now to take part in GALVANIC. We had to dole them out where most needed and never had anywhere near enough of them during the GALVANIC Operation." Knowles ltr. V PhibFor Rpt of GALVANIC Comm, op. cit., p. 2. SP Ops, Anx 4 to 27th InfDiv AdminO 11, dtd 26Oct43; see also Crowl and Love, Gilberts and Marshalls, pp. 48--49, 102. TF 53 Unloading and Beach Pty Plan, op. cit. The usual components of standard rations were: D, an emergency individual ration--a special chocolate bar; C, the individual combat ration--canned hash, stew, or meat and beans, biscuits, sugar, powdered coffee, and candy; K, another emergency or combat ration--breakfast, dinner, and supper units, each consisting of tinned luncheon meat, biscuits, sugar, and gum; B, a rear-area unit ration--canned meats, dried or canned fruit and vegetables, canned bread, or biscuits. Details of Loading of GALVANIC Ship, Encl 1 to V PhibFor AR; VAC AdminO 4-43, dtd 13Oct43; 2d MarDiv OpO No. 14. Ibid., p. 1168; Maj Arthur J. Rauchle ltr to CMC, dtd 12Jun47; 2d MarDiv, 3/2, and 3/6 WarDs, Oct--Nov43 (Unit Rpt File, Hist Br, HQMC) ; Johnston, Follow Me!, pp. 94-95. LtGen Robert C. Richardson, Jr., USA, ltr to LtGen Thomas T. Handy, USA, dtd 5Nov 43 (OPD File 384 PTO--Sec II, RG 115, WW II RecsDiv, FRC, Alexandria, Va.). Morton MS, ch. 23, pp. 22--25. Wesley Frank Craven and James Lea Cate, eds., The Pacific: Guadalcanal to Saipan--The Army Air Forces in World War II, v. 4, (Chicago: University of Chicago Press, 1950) pp. 290-302 hereafter Craven and Cate, Guadalcanal to Saipan; TF 50 AR GALVANIC, 10-27Nov43, dtd 4Jan44; CinCPac-CinCPOA WarD, Nov43, dtd 28Feb44 (CinCPac File, HistBr, HQMC). Additional sources for this section include: JICPOA Buls 4--44, Study of Japanese Instls on Butaritari Island, Makin Atoll, dtd 14Jan 44, and 8-44, Japanese Fors in the Gilbert Islands, n.d (IntelFile, HistBr, HQMC); VAC G-2 Study and Rpt, Betio, dtd 23Dec43; 2d MarDiv and JICPOA Study of Japanese Def of Betio Island, Tarawa, dtd 20Dec43. Chief, War Hist Off, Def Agency of Japan ltr to Head, HistBr, G--3, HQMC, dtd 19Nov62, hereafter Japanese Gilberts comments. Hattori, Complete History, III, p. 4-5. So great was the destruction on the island that a postoperation count of light machine guns was impossible. Quoted in Stockman, Tarawa, p. 86. Four Japanese bombers failed to return from attacks made on the 19th and 10 from attacks mounted on the 20th. Japanese Gilberts Comments. For the story of this significant series of aerial assaults see Shaw and Kane, Isolation of Rabaul, pp. 481-486.